Punkte Benötigt: 2950 Por favor, añade este título a tu Lista de deseos e Inicia sesión con tu cuenta My FedEx Rewards desde un dispositivo compatible. Notice : Activation key must be used on a valid Steam account, requires internet connection. 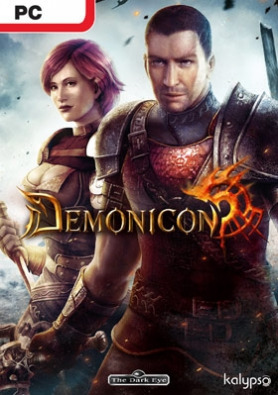 ABOUT THE GAMEThe Dark Eye - Demonicon is a thrilling action-RPG set in the extraordinarily popular universe of “The Dark Eye”, a richly crafted fantasy world beloved by fantasy gamers throughout the world. The Dark Eye - Demonicon tells the tragic story of a brother and sister who become pawns … of sinister forces in a world of cruelty and depravity. In this bleak yet magical world, their affection is both a blessing and a curse. Both are constantly threatened by mortal danger and demonic temptation, and must find a way through their tortured lives by facing serious moral decisions. Their common destiny will determine that of the entire continent, and will be decided by the choices they make. Hordes of fiends block their way to freedom and peace, and only through battle and magic they will truly become free of the darkness. KEY FEATURES A third-person action-RPG featuring brutal melee attack combos and dazzling magic spells	Powerful storytelling with an elaborate narrative rich with twists, as well as believable conflicts and ethical decision-making opportunities Action-packed battles, where pin-point timing and clever tactics play important roles	Unique magic system: a dark talent grants the player devastating mystical powers and changes his physical appearance	Comprehensive crafting system allows for creation of potions, poisoned blades and enchanted armor	State-of-the-art 3D visuals using the powerful Havok Vision engine	A richly detailed game world embedded in the extensive fantasy world of The Dark Eye	SYSTEM REQUIREMENTS Minimum : OS: Windows XP SP3 (32bit), Windows Vista / 7 / 8 CPU: 2 GHz Dual-core RAM: 2 GB HDD: 10 GB GPU: Dedicated DirectX 9.0c compatible graphics card with 512MB VRAM and Shader Model 4.0 support. ATI/AMD Radeon 3800 series and higher, NVIDIA GeForce 9600GT and higher. Sound: DirectX 9 compatible	Recommended : OS: Windows Vista / 7 / 8 (64bit) CPU: 3 GHz Quad-core RAM: 4 GB GPU: Dedicated DirectX 9.0c compatible graphics card with 1GB VRAM and Shader Model 5.0 support.